Becoming a parent to a premature baby is a journey no one can prepare you for. Your expectations of parenthood are disrupted by the critical needs of your medically fragile infant. Whether your baby is currently in the Neonatal Intensive Care Unit (NICU) or has been discharged, the effects of this life experience can have a profound impact on all aspects of your life. NICU parents often report adverse mental health effects such as depression, anxiety, isolation, grief, and post-traumatic stress disorder. Studies have shown that about 10-15% of all mothers are at risk of postpartum depression and mood disturbances, but for mothers of premature babies, this estimation jumps to 28-70%. Fathers and other caretakers are not immune to this either. 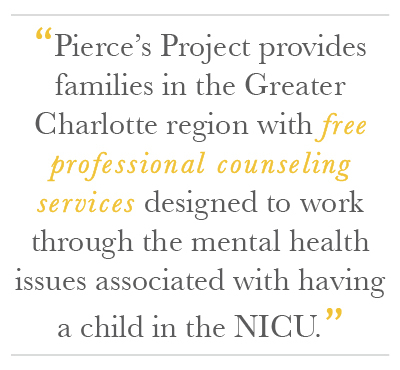 Our team at Pierce’s Project consists of former NICU parents who understand firsthand how detrimental the consequences of a NICU experience can be. We wholeheartedly believe professional counseling is an invaluable resource in dealing with these ill effects. And studies back that belief, showing that the use of therapeutic interventions can significantly reduce the risks of the consequences of NICU trauma. It is our hope that through this program, parents can seek out the support needed to help them navigate this difficult experience without worrying about the expense so that they can have a meaningful relationship with their newborn and continue to thrive in their lives. If you are a parent with past or present NICU experience and you would like more information on how to access these counseling services, please fill out the contact form and a member of our team will be in touch shortly.